I live the n WI, Zone 5. This year yellow jackets are swarming the ground and branches on my flame willows that are 3 years old. There is no nest I see them coming in and out of, therefore I am thinking I have a problem with the willows. What can I treat the willows with to get rid of the yellow jackets? Most wasps are attracted not to a specific plant, but to the aphids that are on it. If you see black sooty mold, shiny stuff covering leaves and everything around, chances are that the plant has aphids. Wasps treat these tiny insects like cows, herding them from one place to another, and then milking them of the 'honeydew' - a nice phrase for aphid poo. To get rid of the wasps, get rid of the aphids. As it's going into fall, they are no doubt dead, or will be soon. That's it for this year, but next year they'll be back. 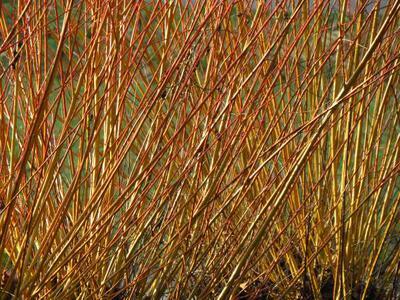 Here's a good treatment for willows especially; coppice them and cut them right back to the ground, burn the twigs, and let them start fresh next year. Do yourself and the earth a favor; don't spray any kind of pesticide on them. Aphids are actually a good source of protein for birds and other predating insects, like lady bugs. If you look carefully, you may have seen lady bug larvae, which look like little dark grey alligators. You really don't want to kill off any of these great predatory insects just to get rid of a few unsightly wasps.